With the Home Automation Wall Mounting Cabinets you can easily organize your home management. Inside of the sturdy housing you can fix various accessories and mounting plates which offer space for active- and passive network components. With this, the individualization of e.g. cabling of your WLAN router, your switches or patch panels, is given to your choice. The cable management takes place via cut outs on the top- and bottom side of the housing. Plastic covers with breaking points ensure optimized possibilities for organizing your cables. The cabinets get delivered as surface mounting version. 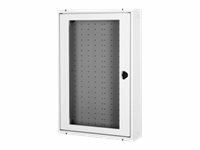 With optional frames you can convert your housing into a flush mounting version.